This is "Frankish Empire (1651)" by Zrew33, a newcomer to Map Monday. Zrew33 doesn't go into to many details about the map's backstory, but we do know that "Charlemagne only has a single legitimate heir. This allows for a more solidified Frankish Empire that eventually splinters sometime after only to reforms back into the Empire under similar situations as OTL Holy Roman Empire." 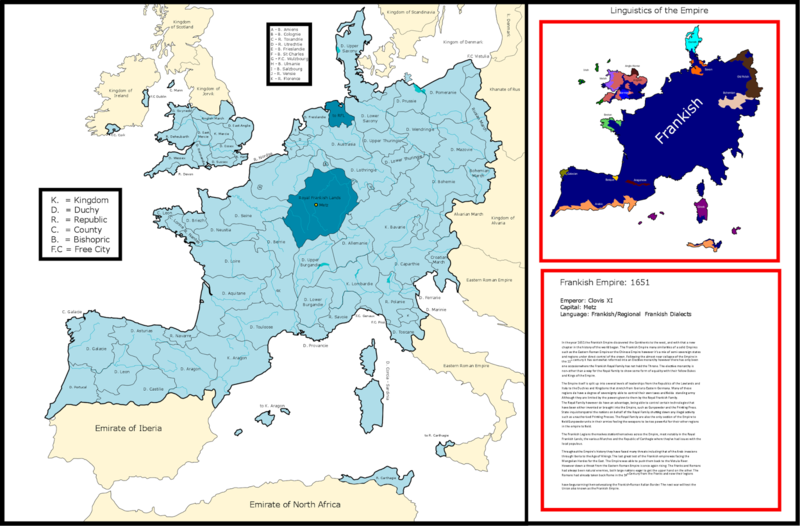 The result is an empire with an elective monarchy usually given to Charlemagne's heirs. Their current rival is the Eastern Romans, but they have gunpowder legions and the resources of the newly discovered western continents with which to deal with their enemies. The map is very well done, but the description included with it needs some work. The content isn't bad per se, its just poorly presented, with a lot of grammatical errors and typesetting issues. Let this be a warning to everyone that adding text to a map is as much of an art form as drawing border or coloring a region. Still its a worthy map for Map Monday and a good example of a more successful Carolingian Empire.